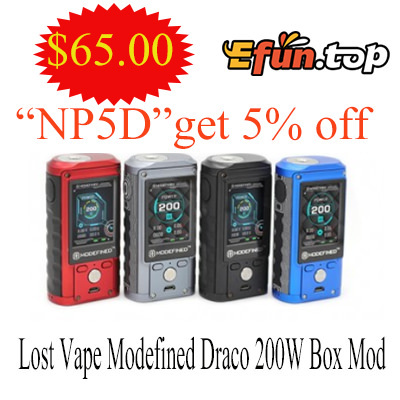 Lost Vape released new Box Mod .The Lost Vape Modefined Draco 200W Box is powered by dual 18650 batteries with 5-200W output. Modefined Draco has 2 inch colorful screen, which demonstrates a wide range of information through a user-friendly interface. Also, it's beautifully processed with a die-cast zinc alloy frame and G10 side panels. And the smart chipset inside plays high performance and ergonomic functions. Besides, its battery cover could be open simply by a flip, and the spring-loaded nickel-plated brass pin guarantees tight and stable connection.